Isn't this ADORABLE? It makes me want to go find an old school desk just so I can do the same thing! She has some other cute numbered projects as well. You can see her post here. Simply FABULOUS! Lulu at Lulu & Co. found this great "bench" on a recent antiquing trip. If you've never been to Lulu's blog, you better hurry on over. She always has something inspirational to share! And Don't Forget the Frugal Friday Linky Party this Friday, May 29th!! Meet here and share your Frugal Decorating Genius!! I saw your mudroom/closet in Creative Home and LOVED it! I'm so glad I found your blog via blog hopping! Your work is always so neatly done and creative. Love visiting you. I have an old desk like that - hmmm. cute, cute, cute! I'd also like to say I am SO EXCITED about the linky party! Oh I may have to make something today. My Fave number has always been 4 and I have four children. Love all the pics!! I especially love those stools! Do you use stencils or paint the numbers free hand? On my dining chairs I created a stencil by printing the numbers out on cardstock and cutting them out using an xacto knife. Then I traced them onto the chairs, but I painted them in without the stencil just using the outline. For the barstools, I actually used a Cricut machine and made vinyl stick-on numbers. Much easier, but I think I like the painted-on number numbers better. I just wanted the barstool numbers to be removable. Love all of those projects! Thanks for sharing the links, I can't wait to check them out. OK, you have made me number crazy!! You might be hearing from my family soon.LOL! 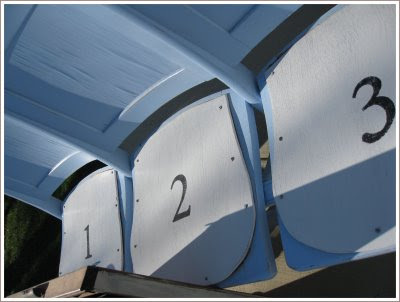 I just finished recovering my sunroom chairs with drop cloth and adding numbers made with iron-on transfers. I'm sure the numbers will wander to other rooms soon. I'm inspired,...what else is new?? :) What I am really loving is your retell of the 3% story. Sometimes a little bit of perspective can sure help you re-motivate!! First it seemed to be that anything themed with the beach was really hot. Then it was birds (and still is.) And now it's numbers. Amazing how these things seem to strike everyone's fancy at the same time, huh! aaahhhh, I am so excited about doing the numbers on my kids' little school desks! What is it with the numbers? They are totally taking over the monogram! Love it! I love your blog and wanted to share an award with you that someone passed along to me! Feel free to pass it along. Thanks for the inspiration! I just finished my bar stools. I did letters for the kids names instead of numbers.